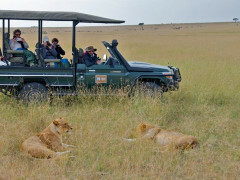 Why The Great Kenya Migration Safari? “And here we are, the birthplace of safari. The only place one can witness the greatest journey in the animal kingdom: the Great, Kenyan, Migration. Thank you, Sir David, we couldn’t have said it better ourselves! Cutting straight to the chase, as it were, Natural Habitat Adventures fly directly into the bush during peak season to offer the finest migration experience a human can have. Unless you’re Sir David that is - he’s practically a member of the herd. In fact, I'd wager that many of the animals know him informally as just, "Dave". Your guides, the most highly trained safari expedition leaders in Africa, focus on two locations where tourists are sparse and wildlife is most prevalent. The first camp is a lesser known area at the heart of the Masai Mara that promises prime time, front row seats at turbulent river crossings and graphic predator-prey interactions. 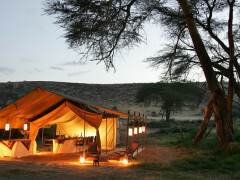 The second camp is an even less frequented area in the private Mara Naboisho conservancy where you can live out your wildest Discovery Channel dreams on bush walks and nocturnal safaris. The closest possible safari encounter during Kenyan migration season. Fly direct into the bush, waste no time getting to the action. Stay at secluded camps away from the crowds.